Montreal, November 5th, 2018— Bright and early on Saturday, November 3rd, 2018, over 500 people including 300 race participants gathered at the McGill Sports Complex for the 17th edition of Splash & Dash, which raises funds for Sarah’s Floor at the Montreal Children’s Hospital through Sarah’s Fund for Cedars. Each team made up of three people ranged from families with young children to corporate teams. What these teams all had in common was a desire to bring awareness, raise necessary funds and help Sarah’s Fund for Cedars Go Beyond their wildest dreams for paediatric oncology. All races that took place throughout the day had three components: run – swim – run or swim– bike – run! 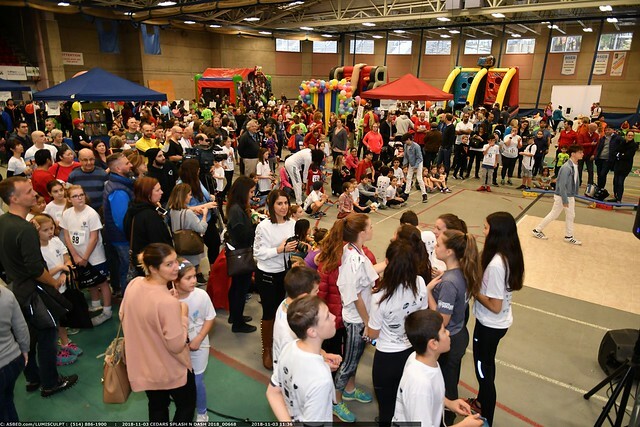 The high energy, family friendly competition was accentuated by the spirited music, blow up attractions, fantastic food and tantalizing raffle prizes! The annual Heroes & Celebrity race was as always, the day’s highlight. Local Montreal celebrities raced with the true heroes of the day, the patients of Sarah’s Floor. With bright smiles and resilience that inspired all who attended – the day’s participants gathered to watch the Heroes race; a powerful reminder as to why the Montreal community has come together for the past 17 years for Splash & Dash and Sarah’s Fund for Cedars.